Evans Miller Guinn Exeter Chapel has the distinction of being the longest continuing funeral business in <?xml:namespace prefix = st1 ns = "urn:schemas-microsoft-com:office:smarttags" />Exeter, where values have been passed from one generation of family owners to another. Our tradition of family service has been evolving for over 50 years. John and Diane Guinn purchased Evans Miller Exeter Chapel in July of 2007, making the name Evans Miller Guinn Exeter Chapel. John started into the funeral business in 1978 at Evans Miller with Don and Laurene Evans. After managing several funeral homes in California, he came back to the Exeter Visalia area in 1999. Diane is a licensed cosmetologist. Together, John and Diane moved to Exeter in 2003. 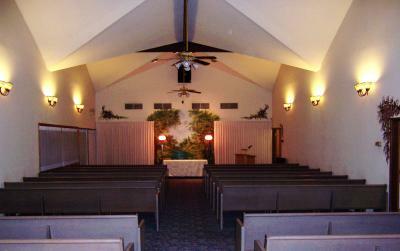 The mortuary today features a spacious chapel with a seating capacity of 200, adequate off street parking and an attractively landscaped setting. The facility is a full service mortuary, meaning that services and merchandise for every type of arrangement, budget and preference are available. Choosing a funeral home is not something families do everyday. But when the need arises, and a decision must be made, families are reassured by our excellent reputation of service. Then, there is the matter of trust and confidentiality. In a time when emotions are strongly felt, there is comfort in being treated with compassion and respect. We have stayed current with the distinctive customs of different cultures and religions, funeral and cremation services. This is to honor you family member and bring closure to family and friends, all sharing a common goal. This is Evans Miller Guinn Exeter Chapel. Often, it’s possible to judge a business by what it is not. We are not part of a chain. We are not a single location among hundreds in a conglomerate. We have no obligation to any out of state “main office.” Families who are suddenly faced with planning a funeral appreciate our assurance that our only obligation is to you, and we will attend to your needs at any hour of the day or night.